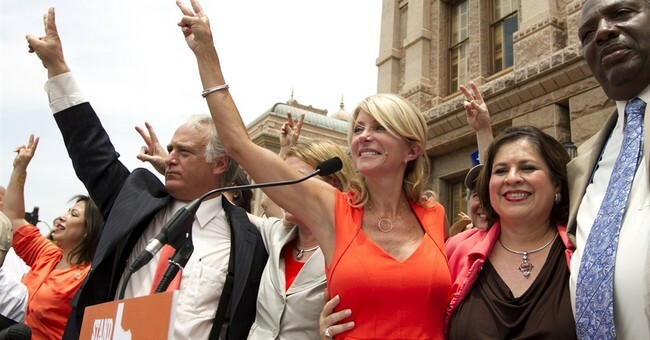 Noonan: Say, Isn’t Wendy Davis Defending the Right to Infanticide? Here’s what — in the story of this young woman, she’s so spirited. You know, she has such energy and she seems to have such commitment. But it seems to me — and I think it seems to many Americans — that what she is speaking for and standing for is something we would recognize as infanticide, late-term abortion, the taking of a little child’s life. That is really, really serious. The Left loves the spectacle of someone fighting for “women’s health” and “reproductive rights,” but will they even care to acknowledge what, in fact, Wendy Davis is actually advocating? The science may not be settled yet, but many practicing physicians acknowledge that pre-born babies can feel pain as early as 20 weeks gestation -- if not earlier. Thus, the purpose of the Texas pro-life bill, HB5, is to protect these innocents from enduring life-ending procedures that are unbelievably violent and painful. To put it differently, anyone who opposes this bill is implicitly affirming a woman's right to subject her precious, unborn infant to wanton violence and death. That, I think, is the point Noonan was making. One can assume I am also not the only woman in America who is really tiring of the Wendys of the world claiming to represent “women’s rights” in their quest to mainstream a medical procedure—elective late-term abortion—that most of the civilized world finds barbaric and abhorrent. In many European countries, you can’t get an abortion past 12 weeks, except in narrow circumstances. Gallup reported in January that 80 percent of Americans think abortion should be illegal in the third trimester, and 64 percent think it should be illegal in the second trimester. As Guy reported on Monday, the people of Australia aren’t falling for this kind of “war on women” foolishness. And we shouldn’t either.